You may be a candidate for liposuction if you have excess subcutaneous fat which is resistant to diet and exercise. Liposuction may also be desirable if you wish to change the contours of your body. Commonly involved areas are the anterior part of the neck (under the chin), upper arms, male chest/breasts (gynecomastia), trunk, abdomen, waist, hips, inner and outer thighs and inner knees. Most patients are near normal weight and desire permanent contour changes. Liposuction is a popular procedure in Chevy Chase, MD, and the Washington, DC, area. Liposuction is intended to produce a permanent improvement in the contour and proportion of the treated areas. A more flattering figure or physique, in or out of clothing, is another goal of liposuction. Liposuction is done on an outpatient basis. General anesthesia is usually used for safety and comfort. Small suction tubes (cannulas) are inserted through very small incisions placed in inconspicuous locations and excess fat is removed. A tumencent fluid is injected into all areas before liposuction to minimize the amount of blood loss during the procedure. In most cases, only 1% of what is removed is blood! This means less bruising and faster recovery. Ultrasonic and Power-Assisted Liposuction are options for certain candidates. Additional energy added to the cannula by this technology requires less force to be used by the surgeon to remove the fat. This means less trauma to the tissue and a faster recovery for the patient. 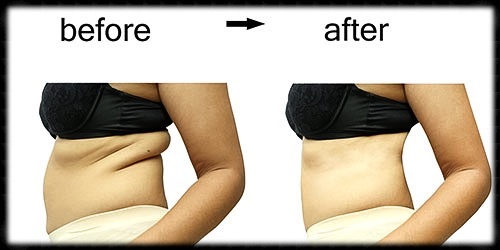 These improved techniques now allow larger amounts of fat removal than ever before. Liposculpture can even be useful to moderately overweight individuals even though is not a weight loss method. Once the surgery is completed, the patient goes home with a compression garment covering the treated areas. Compression is advised for about a month as it helps reduce swelling after liposuction. Once pain and soreness decrease, it is frequently more comfortable to wear lycra or spandex. Initial discomfort is easily controlled with oral medication. Bruising and swelling usually subside in 2 to 4 weeks. The final result takes shape over 2 to 3 months. Additional procedures available in Chevy Chase, MD, and the Washington, DC, area, which may enhance the result of liposuction, are Tummy Tuck (Abdominoplasty), Breast Augmentation, Reduction or Lift. Liposuction is considered cosmetic and therefore is not covered by insurance. The patient is responsible for payment. The specific risks and the suitability of liposuction for a given individual can be determined only at the time of consultation. All surgical procedures have some degree of risk. Minor complications that do not affect the outcome occur occasionally. Major complications are rare. Find out more about this popular procedure in Chevy Chase, MD, and the Washington, DC, area by calling Dr. Lynch. Dr. Lynch is a board-certified plastic surgeon that specializes in abdominoplasty, arm plastic surgery, bariatric surgery, Botox, Brazilian buttlift, breast augmentation, breast lift, breast reduction, brow lift, eyelid lift, facelift, fillers, male body contouring, neck lift, otoplasty, rhinoplasty, thigh lift, tummy tuck, and liposuction.